A True Log Cabin Experience built with Scottish Douglas fir trees. Pet Friendly. A unique post and beam traditional log cabin. 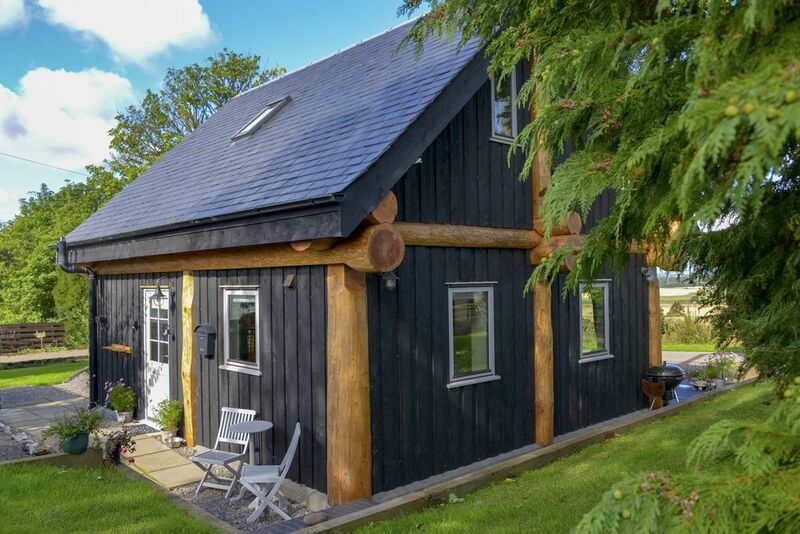 ​Rowanlea Lodge is located on the border between Angus & Aberdeenshire with glorious countryside views towards the Cairn 'O' Mount. The perfect peaceful location to relax and unwind. a double bedroom furnished in Harris tweed and a shower room on the ground floor. The upstairs double bedroom is bright spacious and has a seating area which can be used as an additional double sofa bed. The welcome hamper is provided for all guests which includes local Scottish produce for breakfast to help get your stay off to a great start. The Cabin is a short walk from the North River Esk famous for salmon and sea trout fishing and the small village of Marykirk. Also St Cyrus beach, a nature reserve renowned for its grasslands, rare flowers and butterflies. Cairngorms National Park is approximately 40 miles away with beautiful mountains, forest paths, rivers, lochs, wildlife hotspots, a perfect day out. The Angus Glens are great for walking where you will see some amazing views, an abundance of wildlife and get a taste of rural Angus. The popular coastal town of Stonehaven is a 20 minute drive with many sea food restaurants and famous for the fire balls at New Year, a trip to Auntie Betty's is a must for an ice cream. Montrose is a ten minute drive where you will find many shops, supermarkets cafes a post office and chemist. There is a lovely bistro farm shop a mile away at Balmakewan for a nice lunch and delicious home bakes or a visit to our local pub just a short walk into the village of Marykirk, a former coaching Inn built in the 1800's with a beer garden serving food daily and pet friendly too. If you feel like a cozy night in after a day exploring order a take away and they will deliver for a small charge. Rowanlea Lodge looks forward to welcoming you to this beautiful part of Scotland. 10% discount applies to full week bookings during off peak season. To avoid service and booking fees I can be contacted on 07786255554. I am from the Orkney Islands and moved to the mainland 22 years ago. Having been brought up on a farm I love the outdoors and all animals. I'm a keen gardener and keep active walking my two dogs. I love to meet up with family and close friends especially at some of my favourite restaurants close by. From designing Rowanlea Lodge to the finished build has been a great adventure. I have thoroughly enjoyed doing the interior design and would love to build again in the future. Although in a rural location the cabin is close to many small villages, towns, beaches and beautiful countryside. If you need to get away from it all this is the perfect location. You will love my place. The Scottish Douglas Fir trees that have each been carved by hand and used to provide the solid structure of Rowanlea Lodge to the tasteful decor and luxurious furnishings. After a day exploring you can relax outside at the front of the cabin until the sun goes down and take in the spectacular view. If it's a little cold the wood burner will give you that cozy feel and the view is just as lovely through the double patio doors. I always greet guests on arrival and I'm available to answer any questions about the surrounding area and places of interest to visit. A welcome breakfast hamper sourced from our local farm shop is provided to get your holiday off to a great start, all linen, towels and luxury soaps, free WI-FI, logs and kindling are provided. Our cabin is well equipped for guests so they can settle in and make the most of their holiday. Shower room with a powerful shower and Orkney soaps free from animal testing. Open countryside views towards the Cairn O Mount and Grampian hills. The Lodge is a 5 minute walk from the village of Marykirk. Rowanlea Lodge is close to the River North Esk famous for salmon and sea trout fishing. Electric panel heaters in all bedrooms. There is a large logs store where dogs can be dried off in the winter months. Dog towels are supplied. Seat pads for outdoor furniture, a BBQ and ample logs for the wood burner. Morso wood burning stove. Logs kindling and firelighters supplied. Open Plan with wood burning stove. Tea, coffee, sugar, oil, salt, pepper, kitchen roll, cling film, tin foil. Board games, books & dvd's. Private seating area at the back of the Lodge. Decking at the front of the Lodge facing west. The Lodge was fantastic, so beautiful, comfortable and luxious with lots of attention to detail and little touches. It had everything you need and was so well equipped. The log burner was great and we had a very comfortable and relaxed stay. Lovely peaceful location with a stunning view from the lodge. We had an amazing time and Lorna was so lovely and helpful. Lorna left us a welcome hamper of some food to get us started which was all so delicious- thank you! We loved it! It is also a short walk to the local pub, which is dog friendly (suited us as we had our dog with us) where we had an evening meal - lovely welcome, very friendly abd great homemade and tasty pub grub. We would definitely like to return and will visit again! Thanks! Thanks for leaving such a lovely review Cat Super to hear you enjoyed the relaxing break. A visit to our local pub is always a good choice for some homemade delicious food. You were perfect guests and would be most welcome to visit again. Great little lodge! Wonderful views! The little lodge is great. It's so cute, very clean, and fully stocked. The welcome basket and stocked refrigerator was a special touched that was so much appreciated. We have family and friends in Marykirk so it was great to have the opportunity to stay so close to them. I would highly recommend this lodge (and have already!) Thanks Lorna for the wonderful hospitality. Your gardens are beautiful!! The lodge is situated in beautiful countryside with amazing views, well situated for nice beaches and attractions. The glorious weather added to our holiday, and we enjoyed our weeks stay. The lodge is very comfortable and well equipped with everything you require, Lorna also provided a breakfast pack from the local farm shop and fresh flowers were another lovely touch. Everything is spotlessly clean, the garden is well looked after too and has lots of pots with flowers. We also had the pleasure of watching the lovely birds at the feeders Lorna keeps well filled. No hesitation in recommending this house to anyone. We arrived to find an absolutely fantastic lodge which had everything and much more than we expected. The owner, Lorna, was very helpful and made us feel more than welcome. Highly recommend this property. Thanks for your review. I'm delighted the lodge met all your expectations and more. The weather was just glorious I think summer has finally arrived. I am almost reluctant in writing this review, as I would really like to keep this Highland gem all to myself and my family. However, that would not be fair to the wonderful host, Lorna, the woman that attends to all your needs and more. The Cabin is beautiful down to every last detail, you truly feel that your host wants you to enjoy your time there. It was our first family trip away, just the 3 of us, and we made memories to treasure for a lifetime. Just waking up to the glorious view, whilst your 15 month old searches for the ‘Birdies’ that the many feeders outside attract, to settling down in front of the log burner as the sun sets, it’s the little things that make the experience so magical. For practicality you should know Lorna provided a cotbed, high chair and fire guard which were all clean and in immaculate condition. As was the rest of the cabin I hasten to add. The cabin is easy to travel to and very near to some real natural beauty spots, would recommend St Cyrus Beach. Also you will find a very generous hamper to welcome you to your stay, visit the farm shop that provides the produce, another warm and so welcoming experience. Would highly recommend Rowanlea, we truly have fallen in love and will definitely return. A lot of love for this magical little place. Thanks for leaving such a lovely review. Great to hear you found our holiday home was magical for your first family break, the weather was reasonable and you got out to explore the area too. Bo was adorable, super to find the birds and their antics kept him entertained. Marie at the farm shop always gives a warm welcome and I'm delighted you enjoyed some of the local produce. This property is amazing we probably rent cottages 4 to 5 times a year and this has been the best we’ve stayed at. The attention to detail is second to none and has the impression of being furnished as a home not a holiday cottage such is the quality of the fabrics the fact that they all match, the furniture and beds are of an equal quality and beautifully dressed with throws and cushions. The log burner and radiators keep the lodge really cosy making it a lovely place to come back to after a day exploring or walking. The owner was really welcoming and made sure we knew where everything was before she left us to our own devices in summary the attention to detail in the lodge has bettered many 5 star hotels we have stayed at and we will definitely be returning. Thank you for your lovely review. I'm thrilled you loved it so much. The log burner really does make it a cosy place to come back to especially at this time of year. It was lovely to meet you and I hope you visit again. Also thank you for the gift it was very kind. Please Note: Changeover day is Saturday for Summer breaks. During the rest of the year I am flexible with check in days and will do my best to accommodate requested dates. Payment of 25% is due at the time of booking with the remaining balance due 30 days prior to arrival. To avoid booking fees and service charges I can be contacted on 07786255554. Well behaved pets are welcome.